Happening Now is a feature designed to bring updates, announcements and info on news items throughout the day. You are invited to participate. See a road closure? A business opening? A smoke plume? Storm-related mishaps like downed trees, power lines, road or other flooding? Email us at news@yubanet.com or call 530-478-9600 to let us know. You can also text us reports to 530-409-9888, but please don’t text or call while driving. October 31, 2018 at 11:17 PM Firefighters and law enforcement are on scene of an overturned pickup truck on North Bloomfield Road near Harmony Estates Road. October 31, 2018 at 1:46 PM Photo gallery: Halloween 2018 at the Rood Center The Rood Center looks a lot like Hogwarts today! Treat or treat from 2-4 pm! October 31, 2018 at 12:46 PM The 3 horses are back with their owners! October 31, 2018 at 12:07 PM Three horses, a bay, a sorrel and a buckskin-color, are currently contained in a front yard on Burlington Parkway off John Born Road in Penn Valley. If they are your horses, please go and get them. October 31, 2018 at 12:03 PM Resources are on scene of a reported house fire on Joann Way near Alta Sierra Drive. October 31, 2018 at 9:28 AM Possible smoke report on Hwy 49 near Shoshoni Trail. Engines will check it out. October 31, 2018 at 8:30 AM A PG&E contract helicopter is continuing mapping work for the hazardous vegetation removal along easements today. Presently the helicopter is over the San Juan Ridge area. October 31, 2018 at 8:14 AM Warm, dry and a definite chance of ghosts and ghoulies this evening. A nice day with a 100% chance of scary creatures swarming early in the evening. Be prepared, have your treat go bag ready! October 30, 2018 at 7:06 PM A pickup into a pole on Country Woods Lane off North Bloomfield Road. Emergency services en route. October 30, 2018 at 5:17 PM Smoke in the Wise Road area is driftsmoke from the June Fire. October 30, 2018 at 5:08 PM Smoke check in the area of Wise Road and Bald Road in Placer County, units are en route. Reported as a small column of gray smoke. Air Attack 230 is over the June Fire and reports the smoke from the fire in Butte County is over the Auburn area at this time. October 30, 2018 at 3:35 PM Smoke from the June Fire in Butte County has reached Yuba County and Nevada County. Aircraft and engines from the Nevada-Yuba-Placer unit are assisting Butte County. At this time, there is no fire in Nevada, Yuba or Placer countries. October 30, 2018 at 3:00 PM CAL FIRE/Bute County Fire at scene of a vegetation fire. 2 Four June’s Way, Palermo. 10-15 acres of grass, critical rate of spread. Structures are threatened. October 30, 2018 at 10:54 AM The reported smoke in the Bitney Springs/Conestoga Way area has dissipated. False alarm, engines are returning to their stations. October 30, 2018 at 10:33 AM Red Flag Warning tonight into Wednesday. Gusty winds will spread into the northern Sierra this evening and continue through Wednesday afternoon. Fire weather concerns could persist later into the week with this breezy northerly pattern, but humidity levels are forecast to improve. October 30, 2018 at 10:16 AM Smoke check in the Bitney Springs/Conestoga Way area in Nevada City, engines are en route. October 30, 2018 at 10:03 AM Widespread outage due to major equipment failure in the greater I-80 corridor, 2,637 customers affected. PG&E has assigned a crew to assess the outage. Estimated time of restoration is 11:15 am. October 29, 2018 at 10:45 PM Engine in the area of the North Fire has located one smoldering tree stump. They will extinguish it. Canceling the balance of resources assigned. October 29, 2018 at 10:21 PM Possible flare-up at the North Fire in North Columbia. Homeowner in the area reporting smell of smoke. Engines en route. October 29, 2018 at 9:27 PM Countdown to Election Day (and results): 17,319 ballots have been returned as of today to the Nevada County Elections Office. October 29, 2018 at 7:29 PM Firefighters at the Alta Hill Mine incident report the fire is confined to the oven, they can handle with the resources at scene. All others can cancel and return to their respective stations. October 29, 2018 at 7:27 PM First unit has arrived on Alta Hill Mine Road, nothing showing from the outside. The two next engines to continue in, the balance of resources is to stage on Alta Street. October 29, 2018 at 7:23 PM Baseline IC reports the grass fire has been contained. 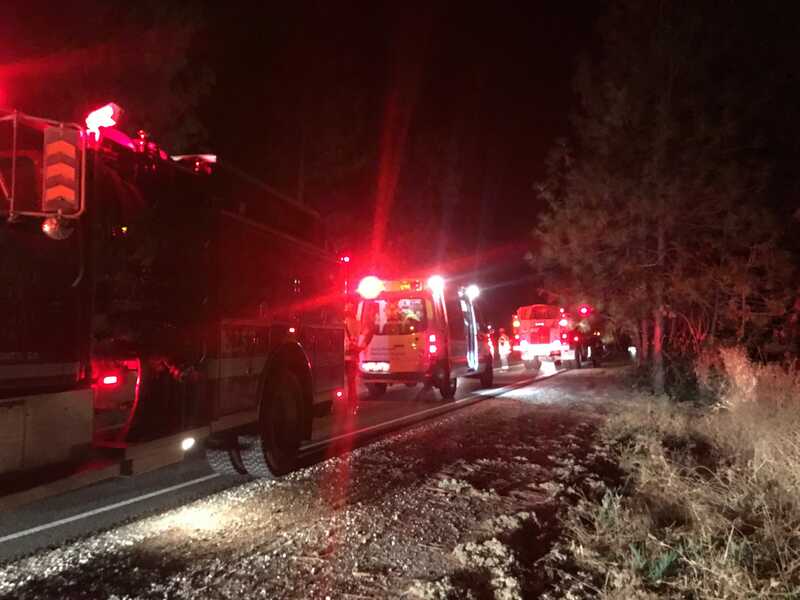 October 29, 2018 at 7:21 PM Residential structure fire, reported as an oven fire, on Alta Hill Mine Road in Grass Valley. Engines en route. 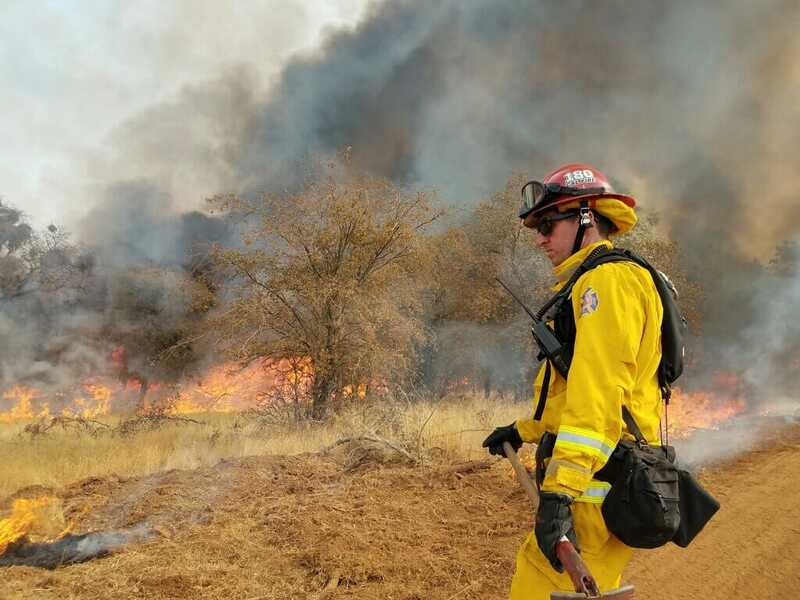 October 29, 2018 at 7:06 PM Baseline IC (Placer County) reports about 2 acres of grass, burning at a slow rate of spread. All units to continue in. October 29, 2018 at 7:01 PM Forward progress has been stopped, canceling the Washington Ridge crew en route to the fire in the Loma Rica area. Resources on scene will remain for mop-up – estimated time out is 1 hour. October 29, 2018 at 6:54 PM Vegetation fire on Baseline Road near Newton Street in the Rio Linda area. Possibly a car fire that extended to the vegetation. Engines are en route. October 29, 2018 at 6:53 PM Firefighters are making good progress, estimated at 1/4 acre with a potential for 1/2 acre. Some outbuildings threatened, two additional engines to continue in. October 29, 2018 at 6:49 PM Firefighters are reporting this to be an abandoned structure with a previous vegetation fire. They are making access now. October 29, 2018 at 6:48 PM Firefighters are having trouble locating the fire, there are no marked addresses in the area of Hwy 20 and Peoria. October 29, 2018 at 6:37 PM Report of a fire on Hwy 20 near the 9000 block of Peoria Road in the Loma Rica area. Reported as a large fire, explosions of propane tanks heard. Could be a residential structure fire with extension to the wildland. Numerous resources en route. October 29, 2018 at 5:14 PM The North Fire is contained. October 29, 2018 at 4:25 PM North Air Attack is requesting Tanker 88 to the fire, Tanker 89 has a tank malfunction. Helicopter 514 is looking for a water source for bucket work. October 29, 2018 at 4:23 PM Air resources are seeing a makeshift structure/lean to, no homes in the immediate area. Ground resources are arriving on scene now. October 29, 2018 at 4:20 PM The North Fire is burning in heavy fuels at a slow rate of spread, per Air Attack. Tanker will drop half a load of retardant now. TNF Helicopter 514 is on scene, they will offload the crew and hook up the bucket. October 29, 2018 at 4:16 PM Air Attack 230 one helicopter and one tanker en route to the North Fire. October 29, 2018 at 4:10 PM Better location for the fire is North Canyon Road. This will be the North Fire. October 29, 2018 at 4:07 PM Black column of smoke seen in the vicinity of the North Columbia School House. On check back, reported as approximately 1/4 acre. Full wildland dispatch en route. October 29, 2018 at 3:29 PM Firefighters in the area have found no fire. False alarm on Honeysuckle Way. October 29, 2018 at 3:11 PM Report of a debris fire in the vicinity of Honeysuckle Way in Nevada City. Engines en route. 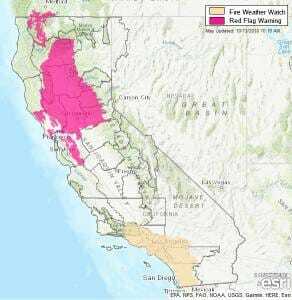 October 29, 2018 at 11:38 AM The National Weather Service has upgraded the fire weather watch to a Red Flag Warning. Periods of breezy winds are expected this week. The first period of concern will be today through Tuesday night over the Coastal Range and then expanding into the western portion of the Sacramento Valley starting Tuesday morning. Gusty winds spread into the northern Sierra Tuesday evening and continue through Wednesday afternoon. Potential fire weather concerns could persist later into the week with a breezy northerly pattern, but humidity levels may improve. October 29, 2018 at 11:28 AM Smoke report from Placer Hills, seeing top smoke through the trees, possibly in the Combie Lake area. Engines in the area attempting to locate. October 29, 2018 at 8:28 AM Fire weather watch in the lower elevations, gusty north winds possible overnight. We will see north winds and that will bring an increased fire weather danger. Please practice wildfire safety! October 28, 2018 at 9:15 AM Cooler and a little breezy today – warm up and dry weather ahead. Breezy off and on winds next week, with elevated fire weather concerns. October 27, 2018 at 5:42 PM Reported vegetation fire, started by an excavator hitting power lines, on Hammonton-Smartsville Road. Multiple small spots reported. Fire resources are en route. 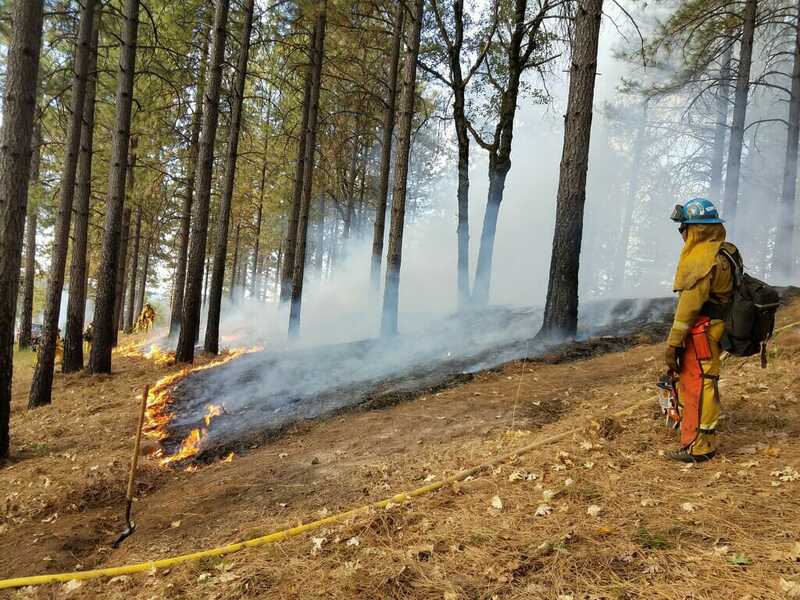 October 27, 2018 at 2:20 PM Firefighters in the vicinity of Donner Memorial have located a 20 by 20 ft spot, resources on scene can handle. October 27, 2018 at 2:08 PM Both Air Attack and ground resources are attempting to locate the reported fire. So far, nothing visible. October 27, 2018 at 1:50 PM Air Attack 230 is over the reported fire near Donner Memorial State Park. The fire is reported as two trees on fire, with some ground fire. October 27, 2018 at 1:24 PM Reported vegetation fire in the Truckee area on Cold Trail Road at Donner Memorial State Park. Numerous engines en route. October 27, 2018 at 1:01 PM Non-injury accident on Hwy 174 at Noel Lane, lanes are partially blocked, use caution in the area. October 27, 2018 at 12:11 PM At this time, there is no active vegetation fire in Nevada, Yuba, Sierra or Placer counties. Haze in the air is remnant smoke from several prescribed fires. At night, the smoke settles in lower-lying drainages (nightly inversion) and rises once temperatures heat up. October 27, 2018 at 11:53 AM A black and white PG&E contract helicopter is inspecting power lines again in the greater Nevada City area. The helicopter is flying low and slow to detect dead and dying trees and branches and map the area where the hazardous vegetation management program will maintain the easements according to the new standards. October 26, 2018 at 11:38 PM Anchor IC reports final acreage is 0.04 acres, all units are available and returning to their respective stations. October 26, 2018 at 10:50 PM Anchor incident has two engines remaining at scene, they will be committed another 30 minutes. October 26, 2018 at 10:30 PM Anchor IC is releasing some resources, the fire is contained. October 26, 2018 at 10:10 PM IC has canceled the prevention officer. Mop-up of the fire is ongoing. October 26, 2018 at 9:56 PM Firefighters are starting to work towards full containment of the Anchor fire. October 26, 2018 at 9:49 PM Forward progress of the Anchor fire has been stopped, firefighters have a hoseline around the fire. October 26, 2018 at 9:43 PM Instead of the water tender, firefighters will use a portable pump and water from the NID ditch. A prevention officer (fire investigator) is en route to the fire at the request of the Incident Commander. October 26, 2018 at 9:39 PM The fire is approximately 1/4 acre, backing down the hill and held at the top by the NID ditch. The IC estimates the resources at scene and those staging and a water tender should be able to handle the fire. October 26, 2018 at 9:37 PM Additional water tender to respond to the fire on Little Hill Lane. Firefighters are making access now, no immediate threat to structures. October 26, 2018 at 9:32 PM Firefighters have located the fire, estimated at approximately 1 acre off Little Hill Lane. Difficult access for engines. October 26, 2018 at 9:29 PM Engines are in the area, attempting to locate the fire. Incoming units to stage on Greenhorn Road at the intersection of Anchor Lane. October 26, 2018 at 9:25 PM Report of a vegetation fire on Anchor Lane, off Greenhorn Road. Reported as 100 ft spot along the NID ditch, numerous engines en route. October 26, 2018 at 7:13 PM Bear hit by a car on Allison Ranch Road. The driver has been advised to stay in the car and not approach the injured bear. Animal control is en route for the approximately 300 lbs bear. October 26, 2018 at 4:20 PM The helicopter circling over the greater Nevada City is inspecting power line easements for PG&E – looking for dead or dying trees. October 26, 2018 at 2:30 PM The helicopter circling over Nevada City and surrounding areas is not a law enforcement helicopter. There is no escaped convict or felon hiding in the bushes. We checked with both the Sheriff and Cal Fire dispatch, none of them have any aerial operation going on at this time. October 26, 2018 at 10:14 AM All engines are clear of the National Hotel, incident caused by ongoing work inside and a faulty heating unit. October 26, 2018 at 10:10 AM Light smoke showing from the National Hotel (closed for remodel) in Nevada City. Firefighters are on scene and can handle with the resources already present. Still incoming units are being canceled. October 26, 2018 at 10:02 AM The prescribed fire at Mt. Howell is continuing. CAL FIRE units are on scene and will remain until the control burn is out. Smoke will be visible from I-80 in the Weimar and Colfax areas. There is no need to report the smoke. October 26, 2018 at 9:01 AM Warm temperatures will continue today and Saturday. A cooling trend starts on Sunday. October 25, 2018 at 6:13 PM Possible illegal debris burn in the Penn Valley area. Engines en route. October 25, 2018 at 1:04 PM QuailFire on Upper Quail Mine Rd in Tuolumne County is a residential structure fire spread into wildland and another structure. Currently two acres with ground and air resources at scene. North of Sonora and east of Columbia. October 25, 2018 at 12:00 PM Smoke report from Oregon Peak, about 25 miles due north from the lookout. White column of smoke with a medium build. 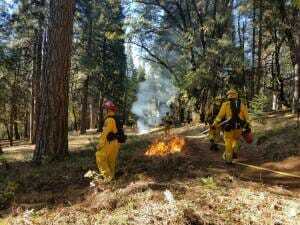 This is a prescribed burn on the Plumas National Forest. October 25, 2018 at 10:15 AM Ignition of the prescribed burn at Mt. Howell after the safety briefing was held. Smoke will be visible from I-80 and the Colfax area. October 25, 2018 at 7:48 AM Starting at 9:00 am today, CAL FIRE will conduct a prescribed burn at Mt. Howell Lookout near Colfax. There is no need to report that smoke, firefighters will be on scene throughout the burn. October 25, 2018 at 7:35 AM Warming back up, breezy north winds possible early next week. After near normal highs the last few days we will see warmer temperatures for the end the week. October 24, 2018 at 6:10 PM The Mountain House fire’s final sizeup is 0.05 acres. The cause was an electrical short in a control panel. October 24, 2018 at 5:26 PM Releasing most units from the Mountain House incident. Fire is contained to less than 1/2 acre. October 24, 2018 at 5:00 PM Full wildland dispatch for a small vegetation fire on Mountain House Road, between Bitney Springs and Wildwood. October 24, 2018 at 11:51 AM CHP is providing one-way traffic control on Hwy 49 just south of the 49’er bridge while the burned car is being removed. October 24, 2018 at 11:38 AM Reported car fire on Hwy 49 south of Tyler Foote Road near the bridge. Emergency services are on scene for a black Chevrolet SUV on fire. October 23, 2018 at 5:06 PM Units at scene on Hwy 20 report a small amount of smoke coming from under the bridge, they will make access now and investigate. October 23, 2018 at 4:57 PM Smoke check, single report of smoke coming up from under the bridge in Hwy 20 at Pleasant Valley Road. Engines en route. October 23, 2018 at 4:23 PM Air Attack 230 confirms the smoke seen north of Lake Wildwood is from the prescribed burn in Browns Valley. The burn is consuming some very resinous materials right now, hence the increased smoke. October 24, 2018 at 8:32 AM Coolest day of the week, warmup begins Thursday. Ridging from the eastern Pacific builds along the West Coast beginning Thursday and continuing into the weekend resulting in further warming of max temperatures to well above average. October 23, 2018 at 4:13 PM The prescribed burn at the UC Field Station in Browns Valley is putting up a lot of smoke at this time. A small plume can be seen from Penn Valley, Grass Valley and surrounding areas. This is a prescribed fire, with numerous firefighters on scene. There is no need to report the smoke. October 23, 2018 at 3:23 PM The small electrical fire has been extinguished. Canceling most incoming resources. October 23, 2018 at 3:15 PM Reported residential structure fire on Jayhawk Drive in Lake Wildwood, possibly a garage on fire. Numerous engines en route. October 23, 2018 at 11:30 AM All resources have been released from the incident on McCourtney Road. The fire has been contained. October 23, 2018 at 10:58 AM Full wildland dispatch to a vegetation fire on Riosa Road off McCourtney Road in the Thermalands (Placer County.) Reported as a 30 by 40 sq ft spot, possibly started by a county lawn mower. October 23, 2018 at 9:46 AM The Tahoe National Forest prescribed fire on Henness Pass Road between Alleghany and Forest City has started. October 23, 2018 at 9:27 AM Hwy 174 is clear again after a motorcycle accident near You Bet Road. The patient was transported to SNMH. October 22, 2018 at 10:10 PM The reported fire was a legal warming fire in Penn Valley, all engines have returned to their stations. October 22, 2018 at 9:49 PM Report of a possible vegetation fire, possibly on Judas Ear Court near Shepard Road in Penn Valley. Engines are in the area. October 22, 2018 at 3:55 PM Report of a fire in the Bunker Meadow area was a FALSE REPORT. No fire in the Bunker Meadow area. October 22, 2018 at 3:48 PM Eldorado NF fire units are responding to a report of a fire in the area of Bunker Meadow. October 22, 2018 at 3:20 PM Report of a rice field on fire along Hwy 20 at the 8800 block of Loma Rica Road in Yuba County, numerous engines, dozer and a Washington Ridge crew en route. 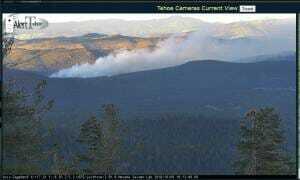 October 22, 2018 at 2:06 PM Smoke from a 54-acre prescribed burn at the Blodgett Forest Research Station west of Stumpy Meadows Reservoir can be can be seen in the Georgetown, Foresthill and Volcanoville areas. The smoke might drift into the lower elevations near Placerville in the evening. CAL FIRE is on scene and monitoring the prescribed burn. There is no need to report the fire. October 22, 2018 at 10:54 AM TNF engines are responding to a smoke report near Little Truckee Summit. 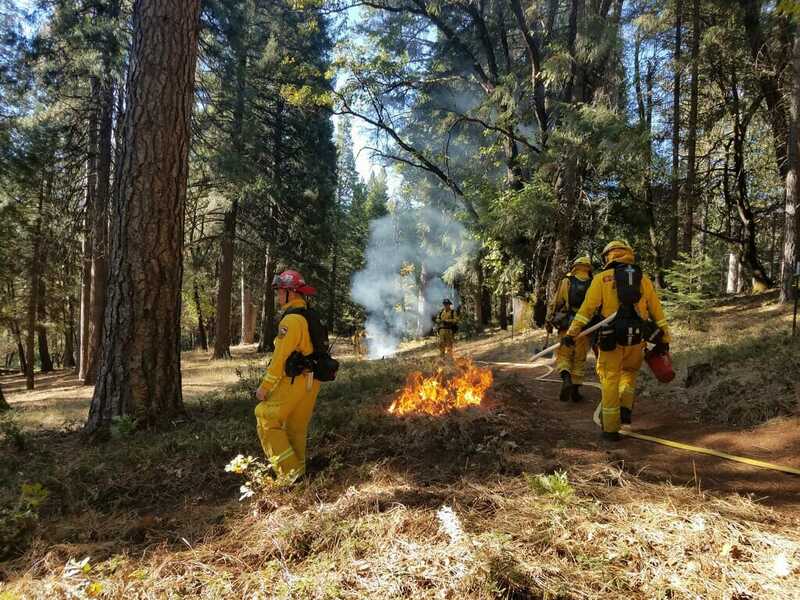 October 22, 2018 at 10:18 AM Successful ignition on the prescribed CAL FIRE/Placer County Fire burn near Alta. October 22, 2018 at 8:47 AM CAL FIRE to conduct prescribed fire operation for the Alta Vegetation Management Project. Smoke may be visible along I-80 and in Alta. October 22, 2018 at 7:26 AM Slight cooling trend to start the week. More active weather remains well to the south and east of the forecast area with clear skies across interior NorCal. October 21, 2018 at 5:54 PM Fire has been extinguished, light mop-up is ongoing. Excess resources are being released. October 21, 2018 at 5:41 PM Dispatch is reducing the incoming resources, reported smoke may have been a BBQ. October 21, 2018 at 5:35 PM Reported residential structure fire in Alta Sierra, Crotty Court. Numerousengines en route, reported as a 2-story residence. October 21, 2018 at 11:29 AM The burnpile on Hwy 174 has been extinguished. Homeowner was educated and cited. October 21, 2018 at 11:09 AM Firefighters have located the property on Hwy 174 where the smoke originates, they are walking in now. October 21, 2018 at 10:53 AM Per the lookout, smoke has now dissipated. Engines are in the area attempting to locate the presumed burn pile. October 21, 2018 at 10:50 AM Smoke check in the Hwy 174/You Bet area. Banner Mountain lookout reports blue smoke showing in the trees. Several engines en route. As a reminder, the burn ban is still in effect. October 21, 2018 at 10:42 AM The Orionid meteor shower peaks tonight. Tonight’s moon will somewhat hamper the viewing, but to see the maximum amount of meteors, look at a dark patch of sky about 30-40° away from the constellation Orion. October 20, 2018 at 7:29 PM Report of a person setting grass on fire near Mooney Flat Road and Deer Creek Road. Reporting party is attempting to extinguish the small spot. Emergency services and law enforcement en route. October 20, 2018 at 11:36 AM Dry and warm weekend with little change ahead. Dry weather and warm temperatures expected this weekend. Cooler temperatures by the middle of next week. October 19, 2018 at 10:08 PM Report of a possible debris burn in the Dog Bar area, smell of smoke and possibly flames seen. Units en route. October 19, 2018 at 9:59 PM Traffic hazard on Rough&Ready Hwy near Squirrel Creek Road, low-hanging phone lines after a pole was hit. Units are on scene. October 19, 2018 at 9:13 PM Eastbound I-80 at the train trestle in Colfax, report of a small fire in the center divide, now extinguished. Numerous resources responded to the call, per a report to CHP someone threw a Molotov cocktail out of a moving car. October 19, 2018 at 7:27 PM All lanes are open again on Hwy 174. One patient transported to the hospital. October 19, 2018 at 7:15 PM One lane closed on Hwy 174 at Lakewood Lane. October 19, 2018 at 3:02 PM Bear River High School was briefly on lockdown because of an incident outside of campus, there was no evacuation at any time. School has ended normally and all students have left the campus as usual at 2:36 pm. A person off campus was shooting for target practice. October 19, 2018 at 10:04 AM The American River Ranger District will begin ignitions on a prescribed burn today. 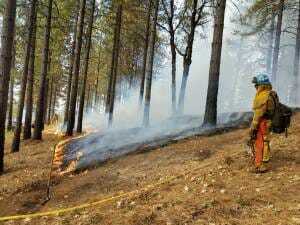 The North Divide prescribed fire will last approximately 3-4 days with up to 600 acres being treated. Smoke from this project on Humbug Ridge will be visible in the Foresthill and Auburn areas. Firefighters will be monitoring the fire throughout the burn, there is no need to report it. October 19, 2018 at 8:22 AM Pleasant temperatures ahead for the weekend. High pressure over the Pacific Northwest and NorCal will bring above normal temperatures this weekend. Saturday and Sunday will see above average warmth both in the morning and afternoon hours. October 18, 2018 at 9:11 PM With no direct access for engines or water tenders, Crew 2, Placer Crew 1, Engine 341 and Engine 2373 will be committed overnight. All other resources are being released until morning. The fire is still 1/4 to 1/2 acre, burning at a slow to moderate rate of spread and held by retardant lines. October 18, 2018 at 6:29 PM The Helester fire is pinned on all sides with retardant and extensive bucketwork by the helicopter. Given the fire’s small size (less than 1/2 acre) and no growth potential, a small contingent of firefighters is making access now. If needs be, additional resources may pick it up tomorrow morning. October 18, 2018 at 6:17 PM Helicopter 514 is doing bucketwork on the fire started by a burnt out vehicle. Cutoff time for all aircraft is approaching rapidly. Retardant drops have the fire boxed in, no ground resources at scene yet due to the difficult access. October 18, 2018 at 6:12 PM Air Attack 17 is over the reported vegetation fire near Sawtooth Ridge in the North Fork of the American River. Difficult access for ground resources. October 18, 2018 at 5:26 PM Additional engines and air tankers requested to the fire on the TNF. The fire was reported as a fully involved vehicle fire with extension to the wildland. October 18, 2018 at 11:01 AM Hwy 89 at the Mousehole is now open. 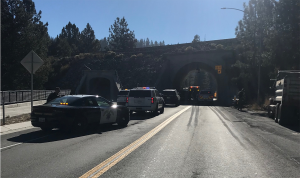 October 18, 2018 at 10:33 AM Truckee Police: Hwy 89S is currently blocked at the Mousehole for a traffic collision. Please use an alternate route. Police and Fire personnel are on scene. Northbound traffic is being diverted onto West River street. Southbound traffic is being turned around at Deerfield Drive. October 18, 2018 at 9:47 AM Fair skies and warm temperatures today. High pressure over the west coast will bring fair skies and warm temperatures today. After a cool morning, daytime highs are expected to rise to several degrees above normal for this time of year. October 18, 2018 at 9:26 AM The Truckee Ranger District of the Tahoe National Forest will continue the prescribed burn in the Billy Hill area. 78 acres are planned for today. The project is located North and West of Hobart Mills, Highway 89N, Sagehen Hills Area. October 18, 2018 at 9:10 AM Report of a small patch on fire on North Bloomfield/Graniteville Road near Harmony Estates Road. Engine 84 en route. October 17, 2018 at 9:43 PM Roadside fire on Sutton Way contained to 1/4 acre by units at scene. Releasing some of the engines. October 17, 2018 at 5:01 PM Vierra IC can handle with the resources at scene, requesting 2 engines and 2 water tenders to continue in. All other resources can return to their respective stations. October 17, 2018 at 4:59 PM First unit at scene reports no extension to the wildland, one 500 sq ft outbuilding involved. Still a threat to the adjacent home but firefighters will have knockdown soon. Canceling the aircraft. October 17, 2018 at 4:46 PM Full wildland dispatch for a structure fire with threat to the vegetation on Vierra Road near Darby Road in the Rackerby area in Yuba County. October 17, 2018 at 12:53 PM Boulder IC is canceling all incoming resources with the exception of one engine. No growth potential, no threat to structures. October 17, 2018 at 12:51 PM First unit at scene reports approximately 1/4 acre burning at a slow rate of spread with one open flank of fire. All aircraft to remain on base. October 17, 2018 at 12:46 PM Now a full wildland dispatch, including Air Attack 230, Tankers 88 and 89 and Helicopter 514 being dispatched to the fire on Boulder Way in Smartsville. October 17, 2018 at 12:45 PM Report of a vegetation fire on Boulder Way in Smartsville, estimated at possibly 1 acre. Units are en route. October 17, 2018 at 12:15 PM The Forest Service, Truckee Ranger District is conducting prescribed fire operations north of Truckee this week. Expected favorable weather and smoke conditions and the TNF is looking to conduct underburns in the following areas. Please use additional caution if traveling in these areas. Expect lowered visibility especially in the evening/ night/ early morning as smoke may hang in low laying areas and drainages. October 17, 2018 at 8:42 AM All is quiet on the weather front. Dry weather with mild days and cool nights will continue through the remainder of the week. The Auburn Police & the Placer County Sheriff’s Office both received tips this morning and the suspect was located by Sheriff deputies and arrested along Christian Valley Road. October 16, 2018 at 6:16 PM PCSO update: The car driven by the suspect in this afternoon’s shooting in Auburn has been located on Clipper Gap Road in Clipper Gap. Deputies are on scene. If you have seen Joseph David De La Cruz in the area, please call 911. October 16, 2018 at 4:07 PM Vehicle accident on Dorsey Drive, emergency services are on scene. Use an alternate route if possible, heavy congestion in the area. Traffic is backed up to Sierra College Drive. The shelter-in-place has been lifted. #PlacerHigh (Auburn, CA) students are being released for the day. Law enforcement will keep a campus presence. Thank you to @AuburnPoliceCA for their responsive action and to our parents and community for their expressed concerns. October 16, 2018 at 3:20 PM Auburn Police Department: The police department is actively working a crime scene on Margarite Mine Road, please avoid the area. There was a shooting that occurred and our staff is working the incident with assistance from the Sheriff’s office and other agencies. October 16, 2018 at 1:10 PM Power has been fully restored in Placer County, including the Foresthill Divide. October 16, 2018 at 10:29 AM Mild days and cool nights this week. Warm and dry weather continues this week. Locally gusty easterly winds continue in the Sierra and foothills this morning. October 15, 2018 at 9:42 PM Units are on scene at Murphy Road, fire appears to be a warming fire. Canceling all units. October 15, 2018 at 9:29 PM Report of a possible debris burn/vegetation fire in the vicinity of Murphy Road on the San Juan Ridge. Units are en route. October 15, 2018 at 11:48 AM PG&E update: The Alta outage is not related to the Public Safety Power Shut off. The Foresthill outages are part of the PSPS because they are served by a transmission line that is part of the PSPS. As of 8 a.m. Monday, weather conditions improved, allowing PG&E crews to begin patrols to thoroughly inspect the lines for any necessary repairs by helicopter, in vehicles and on foot. The company anticipates crews will complete equipment inspections by the end of the day, pending safe working conditions for our employees. Crews will then begin to safely restore power to customers. Due to extreme weather, PG&E shut off power in carefully targeted areas. Thorough inspections are necessary to ensure equipment and lines are not damaged and that our crews are able to safely and quickly restore power to customers. Crews will be restoring power where they can as lines are inspected. October 15, 2018 at 11:26 AM The white sedan is involved in a second accident on Banner Lava Cap and Forest View Drive, roadway is blocked. Emergency services are on scene, checking for injures after a possible head-on collision. October 15, 2018 at 11:23 AM A white 4-door sedan on Banner Lava Cap was involved in a hit and run with a fire truck. The sedan has a broken windshield, just reported as having been involved in another accident. October 15, 2018 at 11:12 AM Firefighters on scene on Spenceville Road have the fire contained. Mopping up the grass fire and the vehicle. No additional resources needed. October 15, 2018 at 11:10 AM Firefighters have a line around the fire. October 15, 2018 at 11:07 AM First unit at scene reports no extension to the home, about 1/4 acre of vegetation and one vehicle involved. Canceling the tankers and the helicopter. October 15, 2018 at 11:04 AM According to NCSO, embers from the vegetation fire are landing on the roof of the home. October 15, 2018 at 11:02 AM Fire on Spenceville Road has possibly spread to a structure. First unit will arrive on scene shortly. October 15, 2018 at 10:58 AM Lookout confirms smoke, now full wildland dispatch including aircraft en route to the fire on the 11600 block of Spenceville Road in Penn Valley. Yard fire now with a vehicle involved. October 15, 2018 at 10:56 AM Reported vegetation fire on Spenceville Road, units en route. October 15, 2018 at 10:12 AM The Red Flag Warning has been extended until 11:00 am on Tuesday. October 15, 2018 at 8:29 AM The American River Ranger District on the Tahoe National Forest is closed today due to no power. Foresthill is in the PG&E shutoff zone. An estimated time for restoration is not available. October 15, 2018 at 7:56 AM Red Flag Warning remains in effect until 11 pm. Critical fire weather conditions will continue through this evening across portions of interior northern California due to a combination of gusty wind, and low humidity. Winds will decrease slowly this afternoon and evening, but will remain breezy over the foothills and west slopes of the Northern Sierra Nevada into early Tuesday. October 14, 2018 at 10:28 PM Placer County: Gold Run, Dutch Flat, Alta, Baxter are now without power. 1,047 customers affected. 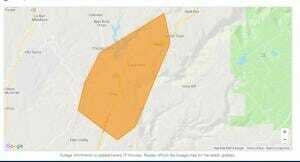 October 14, 2018 at 9:49 PM Placer County: Foresthill, Todd Valley, Michigan Bluff and Yankee Jims are now without power. October 14, 2018 at 9:47 PM Units at scene on Ridge Estates Road report a smoldering tree stump, requesting prevention to respond – repeat occurrence. October 14, 2018 at 9:43 PM Debris check (possible burn pile) on Ridge Estates Road in Nevada City. Units are en route. October 14, 2018 at 9:36 PM As of 9 p.m., PG&E has proactively turned off the power in extreme fire-risk areas of the Sierra Foothills in Amador, El Dorado and Calaveras counties. This is based on localized weather forecasts calling for wind gusts of up to 50 mph Sunday night into Monday morning. Approximately 42,000 PG&E customers are impacted by this Public Safety Power Shutoff in El Dorado, Amador and Calaveras. October 14, 2018 at 9:07 PM Update from PG&E: We continue to monitor in the Sierra, but have not shut off power in the Sierra. However, we have begun to shut off power in the North Bay. Nothing is more important than the safety of our customers and the communities we serve. As of 8:03 p.m., PG&E has proactively turned off the power in extreme fire-risk areas of Lake, Napa and Sonoma counties. This is based on localized weather forecasts calling for wind gusts of up to 50 mph Sunday night into Monday morning. Approximately 17,483 PG&E customers are impacted by this Public Safety Power Shutoff. Factors that PG&E considered when deciding to initiate a Public Safety Power Shutoff included strong winds, very low humidity levels, critically dry vegetation and on-the-ground observations. We know how much our customers rely on electric service, and we are temporarily turning off the power only in the interest of safety, and as a last resort due to the extreme weather conditions. Restoration timing will depend on weather conditions and any repairs needed to PG&E’s electrical equipment. We continue to monitor weather conditions in the Sierra Foothills. We will continue to provide updates about turning off the power for safety in counties in the Sierra Foothills when those decisions are made. 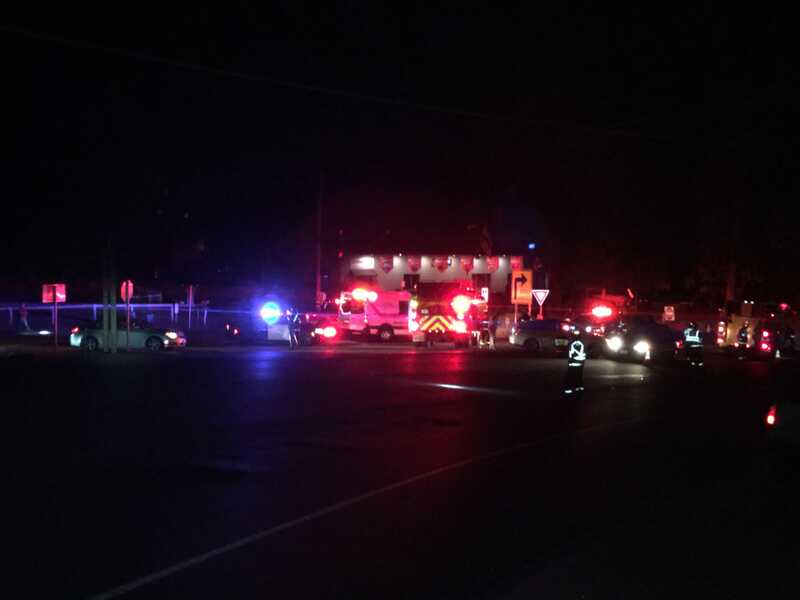 October 14, 2018 at 8:41 PM Accident on Hwy 49 near Dry Creek Road, vehicle vs motorcycle. One major, one minor injury patient. Emergency services are on scene. October 14, 2018 at 7:58 PM Possible bonfire across near Washboard Lane across from Lower Honcutt Road in Butte County. Engines en route. October 14, 2018 at 7:38 PM Tree is out of the roadway on Mooney Flat. No damage to power lines. 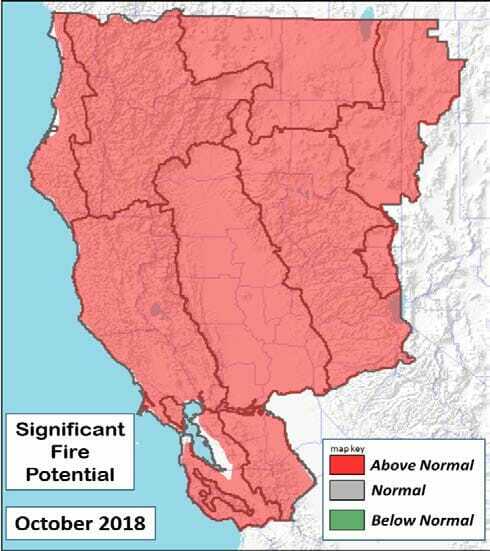 October 14, 2018 at 7:34 PM PG&E update: We continue to monitor evolving weather conditions in the extreme fire risk areas of the Sierra Foothills and North Bay. As of 7pm we have not turned off power for safety. We will continue to provide updates as soon as they are available. October 14, 2018 at 7:29 PM Accident on northbound Hwy 49 near Shoshoni Trail Court. Two cars involved, use caution in the area. October 14, 2018 at 7:26 PM Tree across the roadway on Mooney Flat Road near Pleasant Valley. October 14, 2018 at 6:56 PM Tree blocking the roadway on Young America Mine Road near Mirage Court in Grass Valley. County Public Works has been notified. October 14, 2018 at 6:44 PM PCSO Advisory: PG&E is turning off the power in the Colfax area after 6:00 PM tonight through 10:00 AM tomorrow due to high winds. *Location and time duration may vary due to wind conditions. October 14, 2018 at 6:42 PM 28 homes are without power following the small fire on Meadow View Way in Rough&Ready. PG&E crews are en route, estimated time of restoration in 9:15 pm. October 14, 2018 at 6:41 PM Engines have done a thorough area check on Hwy 20 near Mooney Flat, no fire located. All engines are available for the next incident. October 14, 2018 at 6:37 PM Possible vegetation fire near Hwy 20 and Mooney Flat Road, single vague report only. Caller said they poured water on it before leaving the area. Engines are in the area, nothing showing. October 14, 2018 at 6:26 PM No active fire at this time on Meadow View Way. One engine to continue in, the next engine will stage on top of the hill. The balance of resources assigned is being canceled. October 14, 2018 at 6:14 PM Power lines are down at the reported vegetation fire in Rough&Ready. October 14, 2018 at 6:13 PM Tree down blocking both lanes on Bitney Springs Road near Starduster Drive. October 14, 2018 at 6:12 PM Report of a possible vegetation fire in the Rough&Ready area on Meadow View Way. Full wildland dispatch en route. October 14, 2018 at 6:04 PM Amador-ElDorado Unit has canceled the response coming out of Grass Valley. 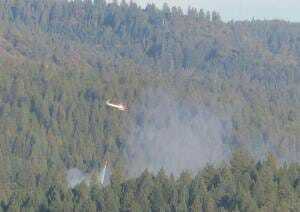 October 14, 2018 at 5:40 PM Vegetation fire in the Cool area near Bald Eagle Trail, full wildland dispatch on order – including all aircraft at the Grass Valley Airport. October 14, 2018 at 5:15 PM Anyone who has received a notice their power will be shut off, prepare now. The likely shutoff time is between 1-3 hours from now. If you haven’t received a notice, you will likely not experience a safety shutoff. However, if a fire starts, power lines in the vicinity will be de-energized as per fire protocol. Stay safe! October 14, 2018 at 1:06 PM Air Attack 17 is over the reported fire near Steamboat, the fire is a 50 by 70 spot, looks like the fire has been smoldering for a few days. Low potential for spread. The fire is in the Wilderness area, extended mop-up operations are likely. October 14, 2018 at 12:44 PM Report of a possible vegetation fire on the Truckee Ranger District of the Tahoe National Forest, east of Little Steamboat Mountain and north of Hell Hole Reservoir. Engines, Air Attack and helicopter en route. October 14, 2018 at 12:33 PM Resources at scene and bystanders have contained the fire, canceling all incoming resources including the helicopter. October 14, 2018 at 12:29 PM First unit at scene reports a 50 by 10 spot along the freeway, resources to continue in for now. 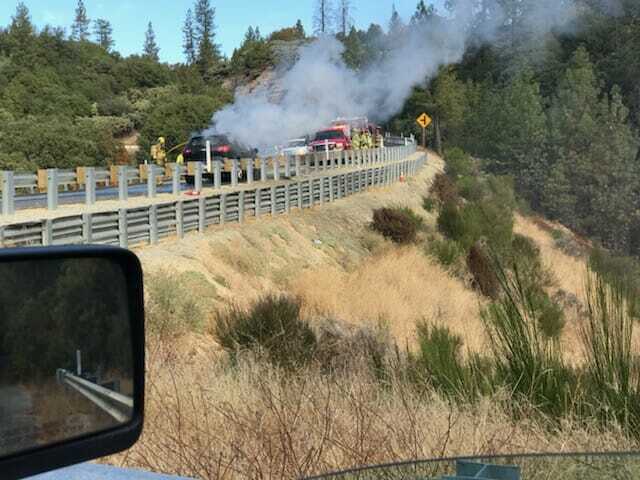 October 14, 2018 at 12:26 PM Report of a vegetation fire on westbound I-80 near Applegate and Dry Creek, reported as multiple spots. Full wildland dispatch on order. October 14, 2018 at 11:31 AM Here’s what’s being done ahead of the wind event and what You should do. Update on the ongoing preparations for tonight’s wind event. Also, a few tips for you on how to get ready. 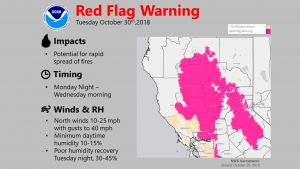 October 14, 2018 at 8:01 AM Gusty winds forecast – Red Flag Warning and Wind Advisory in effect until Monday night. Strong winds are expected for portions of NorCal creating high fire weather danger. Please practice wildfire safety! A Red Flag Warning is in effect for portions of Northern CA due to increased winds and dry conditions. Be prepared & alert! October 13, 2018 at 9:25 PM Units at scene on Banner Mountain Lookout report a small fire, now extinguished. Canceling most incoming units and checking for any possible embers or extension into the residence. October 13, 2018 at 9:12 PM Residential structure fire on Banner Mountain Lookout Road off Banner Lava Cap in Nevada City, reported as a back deck on fire. Numerous engines en route. October 13, 2018 at 8:27 PM PG&E May Proactively Turn Off Power for Safety in Portions of 12 Counties. PG&E could take the action of turning off the power for safety as early as late Saturday night into early Sunday morning. 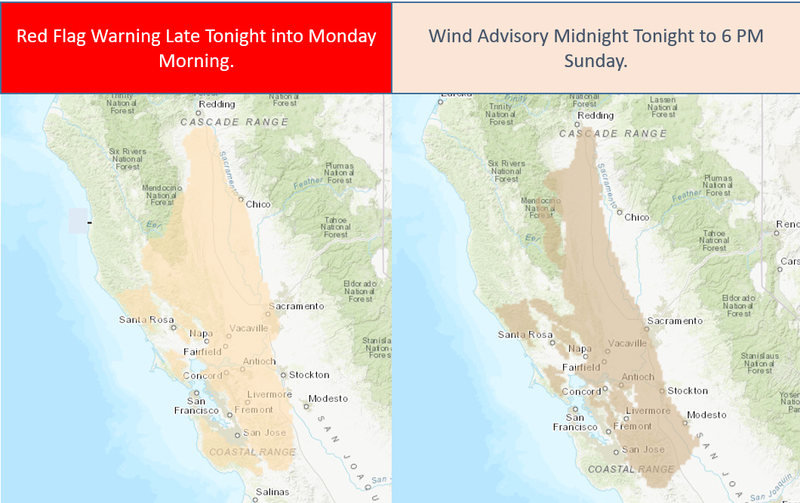 The greater likelihood is potentially turning off the power for safety in advance of Sunday evening wind event that is forecasted to last into Monday morning. 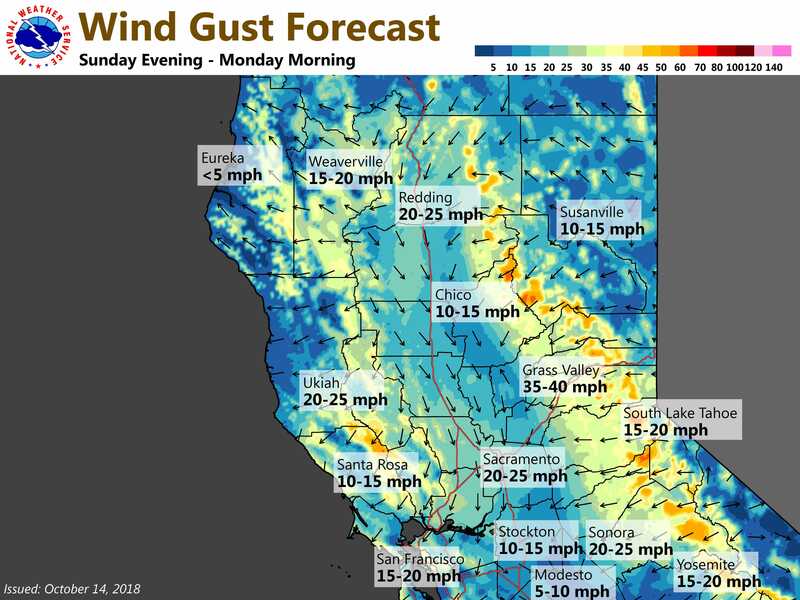 October 13, 2018 at 4:22 PM NWS update: Gusty northerly to easterly winds will develop tonight through Sunday, particularly across the northern and western Sacramento Valley, locally over mountain ridges and canyons. 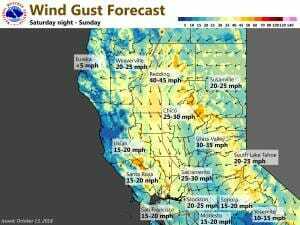 The strongest winds are expected Sunday afternoon, gusting to 40 to 50 mph in the Valley. A combination of gusty winds and low humidity will bring critical fire weather conditions Saturday night into early Monday. 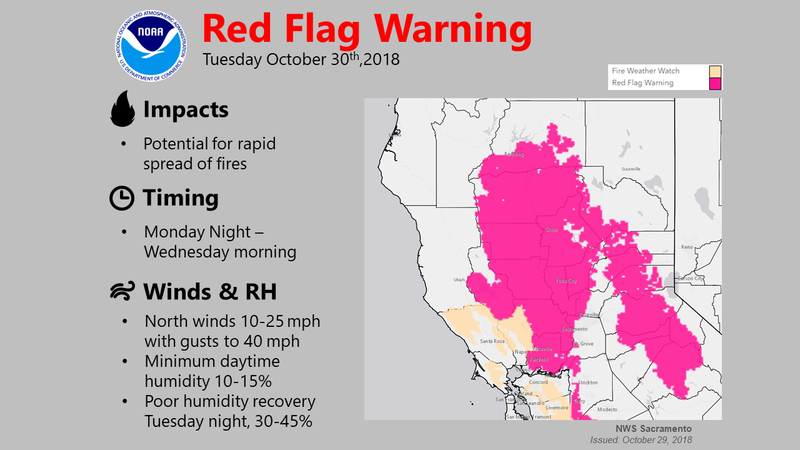 October 13, 2018 at 9:55 AM Update: The National Weather Service in Sacramento has issued a Red Flag Warning, which is in effect from 11 PM this evening to 11 PM PDT Monday. The Fire Weather Watch is no longer in effect. October 13, 2018 at 9:49 AM Increased fire weather danger late Saturday into early Monday, breezy winds & low relative humidity. Northerly winds will increase Saturday night and continue gusty through Sunday. Gusts to 25-35 mph are possible. October 12, 2018 at 10:52 PM Firefighters are making good progress on the Moores incident. Only one Washington Ridge crew is needed, canceling WAR 4. October 12, 2018 at 10:42 PM CHP reports no medical need at the accident on Pleasant Valley Road, medics and fire are returning to their stations. October 12, 2018 at 10:40 PM Head-on collision on Pleasant Valley Road near Hwy 20, CHP on scene, fire and medics en route. Vehicles are blocking the intersection. October 12, 2018 at 10:15 PM Washington Ridge crews 1 and 4 are en route to the fire to assist with line construction and mop-up. October 12, 2018 at 10:09 PM Response from the TNF requested, the fire is maybe an acre in size with no wind on it. October 12, 2018 at 9:59 PM Moores IC is reporting the coordinates of the fire and no change in the sizeup (1acre) and the slow rate of spread. The fire is located on federal land. Resources en route are to continue in. October 12, 2018 at 9:45 PM Moores IC reports access issues. Depending on the location Forest Service will activate resources if the fire is in their direct response area. Should the fire behavior increase, they will respond through the mutual aid system. October 12, 2018 at 9:43 PM Units arriving at scene are making access to the fire, no significant growth reported. October 12, 2018 at 9:30 PM NSJ Firefighters have located the fire on the northeast side of Moore’s Flat. Limited access might be an issue. The fire is less than an acre in size, burning at a slow rate of spread. October 12, 2018 at 9:11 PM Engines and patrol are widening the search area, so far nothing showing. October 12, 2018 at 9:03 PM Cal Fire and North San Juan Fire engines are in the area, attempting to locate the fire. October 12, 2018 at 8:33 PM Report of a possible vegetation fire on Moore’s Flat Road near North Bloomfield/Graniteville Road, northeast of North Bloomfield. The reporting party states a hillside on fire, maybe 1/2 acre. Several engines en route. October 12, 2018 at 5:01 PM A black dog in the roadway on North Bloomfield, just east of Harmony Terrace. 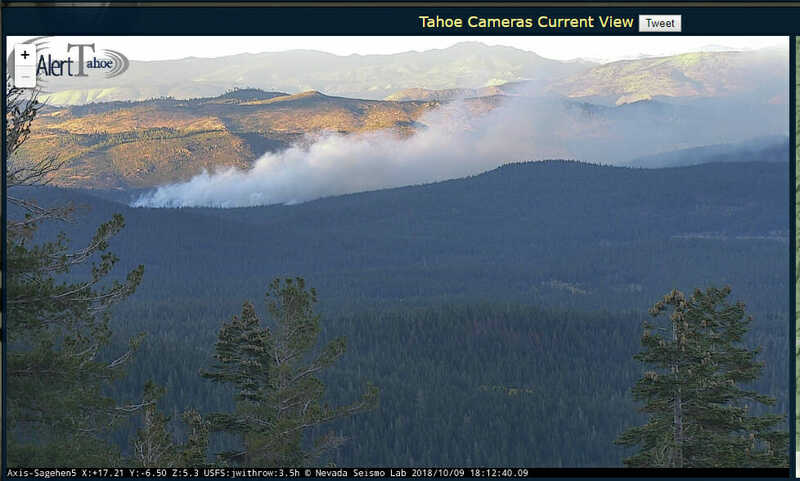 October 12, 2018 at 1:44 PM Smoke in the Hwy 89 area in the area of Little Truckee Summit is from a prescribed burn on the Tahoe National Forest. Burning 100-140 acres is planned for today, part of the Summit North Underburn Project. October 12, 2018 at 1:40 PM Caltrans: Rock blasting completed along Highway 20 in Smartsville in eastern Yuba County. Traffic backed up in the area. Expect delays. One-way traffic control remains until about 4 pm today. October 12, 2018 at 1:27 PM Fire Weather Watch from Saturday night through Monday morning. 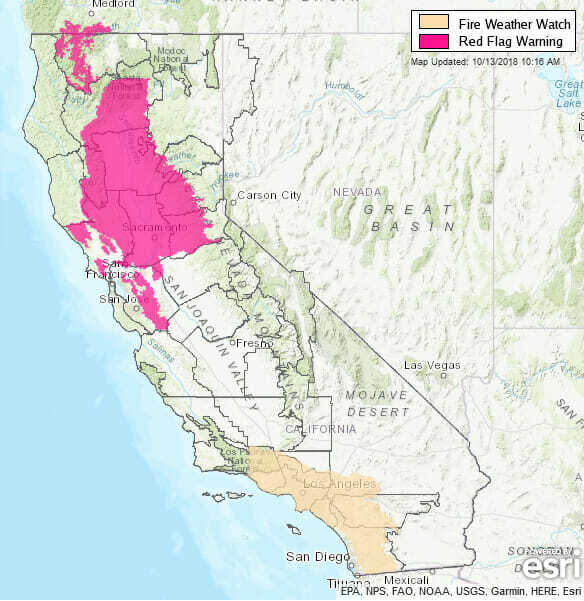 The National Weather Service in Sacramento has issued a Fire Weather Watch, which is in effect from late Saturday night through Monday morning for gusty northeast winds and low humidity. October 12, 2018 at 12:46 PM Alta Street has been reopened. 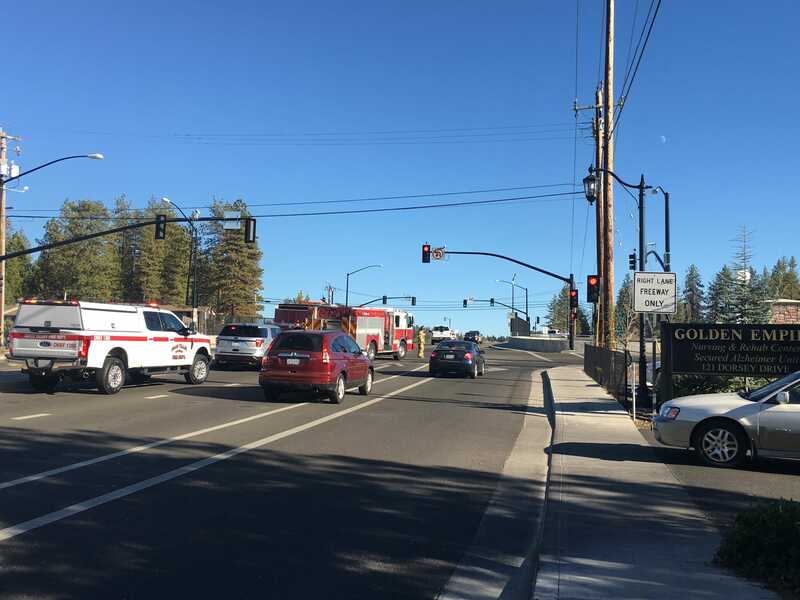 October 12, 2018 at 12:21 PM Alta Street in Grass Valley in front of Mautino Park is still blocked after a three-car accident with major injuries. Numerous emergency services are on scene. Please use an alternate route. October 12, 2018 at 9:35 AM A smoke report in the vicinity of Hwy 49 in Nevada City has been declared a false alarm after firefighters thoroughly checked the area. October 12, 2018 at 8:02 AM Car fire, smoke coming from the engine, on Sierra College Drive. One engine is already on scene. October 12, 2018 at 7:11 AM Warming trend with locally breezy north to east wind through the weekend. Breezy north winds will also impact the north date this weekend especially on Sunday. 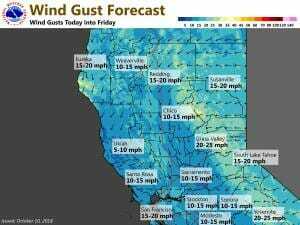 The strongest winds will be over the Sierra Nevada, coast range and west side of the Sacramento valley. These breezy winds and dry conditions will bring periods of increased fire danger this weekend. October 11, 2018 at 5:56 PM Skateboards in the roadway in Alta Sierra on Lawrence Way near Norlene Way are creating a traffic hazard and putting their lives at risk. October 11, 2018 at 5:28 PM Firefighters have checked the area and no fire has been found. Canceling all engines. October 11, 2018 at 5:16 PM Smoke report by two callers, approximate location is Cattle Drive and Rough&Ready Highway. Units are in the area, attempting to locate a possible fire. October 11, 2018 at 3:40 PM Accident on Hwy 20 near Omega Road, emergency services are on scene. One minor injury only. October 11, 2018 at 11:01 AM All burn permits for outdoor residential burning within the State Responsibility Area of Nevada, Yuba, Placer and Sierra Counties are suspended since June 11, 2018. Don’t even think about lighting a burn pile. October 11, 2018 at 8:41 AM Typical Fall weather, dry and breezy with no precip in sight. NorCal will see mainly fair skies today with daytime high temperatures near to slightly below normal for early fall. October 10, 2018 at 7:54 PM All units are clear from the accident on Hwy 174 and Brunswick, the roadway is fully open again. Photo courtesy Peardale Chicago Park Fire PIO Daniel Ramey. October 10, 2018 at 7:27 PM Hwy 174 and Brunswick Road are open, with traffic control in place, after a two-car accident. Emergency services are on scene.USe an alternate route if possible. 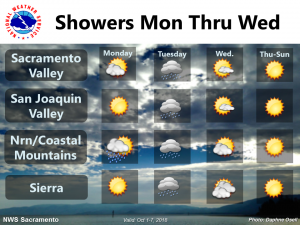 October 10, 2018 at 9:18 AM NWS update: Upper trough will drop down from the north over Interior Northern California today into Thursday bringing a threat of showers over higher elevations of the Sierra Nevada, mainly afternoons into evenings. Light snow is possible over Sonora, Ebbetts, and Carson Passes. 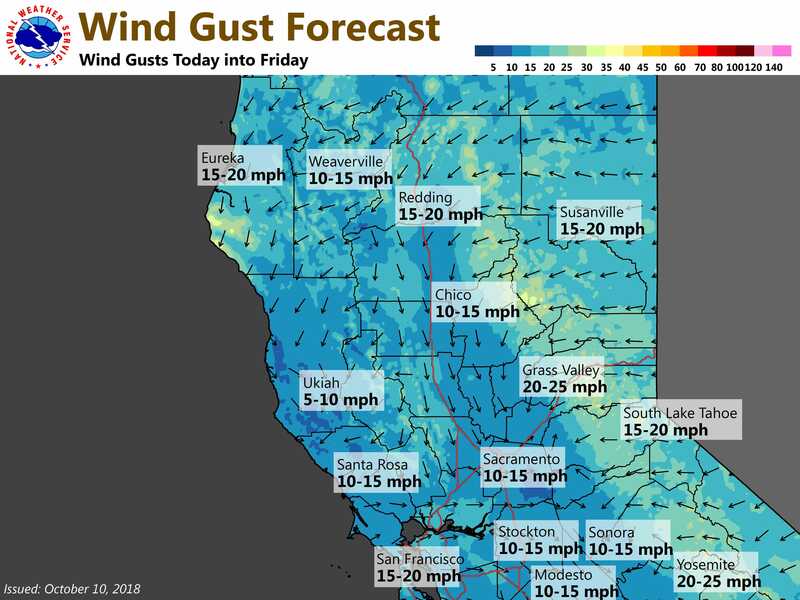 Locally breezy north to east wind will also be possible today into Friday in the Sacramento Valley, Shasta and Coastal mountains, northeast foothills, Motherlode, and favorably oriented canyons of Western Plumas mountains and Sierra Nevada. Drying downslope wind will increase fire weather concerns. October 10, 2018 at 8:09 AM A black lab is running in the roadway on westbound Hwy 20 at the Rough&Ready off ramp. Please watch for the pup! October 10, 2018 at 7:55 AM Westbound I-80 at the Dutch Flat exit, one lane closed due to big rig with a brake fire. Emergency services on scene. October 10, 2018 at 7:08 AM Cooler temperatures, otherwise little change. Slightly cooler temperatures forecast tomorrow across the area. Locally gusty winds expected this evening through tomorrow morning. October 9, 2018 at 6:14 PM The prescribed burn near the Sagehen Experimental Forest has had a good start. The Sierraville Ranger District plans to implement around 500 acres of understory burns and 500 acres of pile burning across the district. Underburn projects are available in the areas of Little Truckee Summit along Hwy. 89 North and Sierra County Road 451 (Cottonwood Road), northeast of Independence Lake area along the Forest Service 07-10 Road, and near the Lewis Mill Guard Station along Sierra County Road 860 (Smithneck Road). Pile burning projects are planned near the communities of Sierraville, Calpine, and Loyalton Pines, as well as in the general Little Truckee Summit/ Independence Lake area, and various other areas throughout the District. October 9, 2018 at 4:54 PM Two-car accident on You Bet Road near Fawn Hill Drive in Grass Valley. Both vehicles are in the roadway, use caution in the area. October 9, 2018 at 12:27 PM The scheduled burn at Humbug Ridge on the American River Ranger District has been canceled for today. The test ignition showed it’s still a little too wet to get good fuel consumption. The burn will be rescheduled in a few days after fuels have dried out a little more. October 9, 2018 at 8:36 AM This morning there will be a hazardous materials training exercise at the Tahoe Forest Hospital. 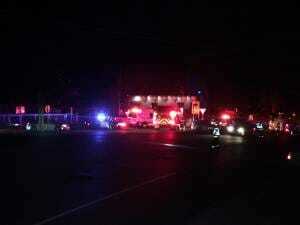 Expect an increased presence of first responders in the area near the emergency room entrance and on Levon Ave. There will be traffic control on Levon Ave. near the ambulance entrance, however all businesses and Nevada County services will remain accessible. The Emergency Room will remain accessible to the public without any hospital operations being impacted. October 9, 2018 at 8:21 AM The American River Ranger District of the Tahoe National Forest will conduct a prescribed burn on the Humbug Ridge area near China Wall in the greater Foresthill area. Smoke will be visible from I-80. There is no need to report the smoke, firefighters will be monitoring the burn throughout the duration. October 9, 2018 at 7:11 AM A dog is running in the roadway on Pleasant Valley Road, headed towards Penn Valley. Described as a white and tan, possibly a pit bull. Please use caution in the area. October 9, 2018 at 6:33 AM Dry, mild and less breezy for the rest of the week. Less windy conditions the rest of the week with seasonal temperatures. North winds will, however, keep daytime humidity values on the low side for this time of year so no end to this summer’s fire season is in sight. October 9, 2018 at 6:23 AM After a very thorough area check, firefighters are returning to their respective stations. October 9, 2018 at 6:16 AM Firefighters are still attempting to find the fire, based on a single report from a passerby in the Rough&Ready area. October 9, 2018 at 6:04 AM Firefighters are in the Rough&Ready area, attempting to locate the reported fire. So far, nothing visible. October 9, 2018 at 5:53 AM Report of a possible vegetation fire in Blue Ravine, near Cochran Road in Rough&Ready. Reported as a glow and possible flames seen approximately a mile from the Rough&Ready Fire Station. Engines, water tender and prevention en route. October 8, 2018 at 2:59 PM Non-injury accident on Hwy 49 at Independence Trail West. One car into the guardrail, emergency services are on scene. October 8, 2018 at 11:06 AM Possible gas leak at the Grass Valley Vets Building, smell of gas in the basement. Units are en route. October 8, 2018 at 11:01 AM Updated location for the aircraft down is now on Bitney Springs Road in a field, units are on scene, reporting no fire at this time. October 8, 2018 at 10:57 AM Report of a single engine aircraft down on Rough&Ready Hwy. No injuries reported to the two occupants. Numerous engines en route. October 8, 2018 at 9:17 AM First unit at scene on Sun Rock Drive reports no fire, false alarm. All units are returning to their respective stations. October 8, 2018 at 9:11 AM Possible residential structure fire in the Forest Springs mobile home park in Grass Valley. Reporting party states smell of burnt rubber after turning on the heat. October 8, 2018 at 8:11 AM Nails in the intersection of Duggans Rd / Lime Kiln Rd, reported to Grass Valley CHP by a passerby. October 8, 2018 at 7:39 AM Breezy north winds will continue across interior NorCal today. Temperatures will be close to average across the region today. 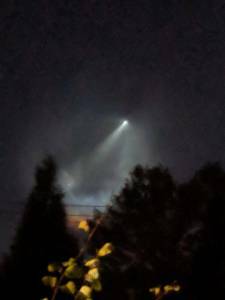 October 7, 2018 at 7:29 PM What you are seeing in the sky is not a comet, it is SpaceX after takeoff at 7:21 pm from Vandenberg Air Force Base. October 7, 2018 at 12:26 PM Breezy with normal temperatures today and tomorrow. A Red Flag Warning is in effect from this evening into early Monday in the lower elevations and the Sacramento Valley. Gusty north winds and low humidity will combine to create critical fire weather conditions tonight through Monday morning. October 6, 2018 at 8:04 PM The fire is contained and extinguished. Mop up of the shed and very small extension to the wildland is beginning. Resources on scene can handle. October 6, 2018 at 8:00 PM Confirmed small outbuilding, fully involved, near the frontage road along Hwy 49. Engines are on scene. No threat to other structures. October 6, 2018 at 7:58 PM Firefighters en route to the reported fire on Hwy 49 report seeing possibly a small outbuilding on fire, they are making access now. One additional engine requested. October 6, 2018 at 7:55 PM Smoke check on the 14500 block of Hwy 49 just south of Grass Valley, reported as smelling and seeing smoke. October 6, 2018 at 3:49 PM Solo vehicle off the embankment on Combie Road near Hwy 49. Emergency services are on scene. October 6, 2018 at 2:59 PM Westbound Hwy 174 is blocked due to an head-on collision (vehicle vs motorcycle) at Lakewood Lane. Numerous emergency personnel on scene. No estimated time of clearing. 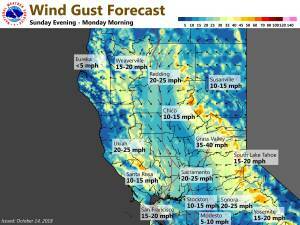 October 6, 2018 at 11:09 AM A change in the weather pattern will bring gusty and dry north winds over the Sacramento Valley this weekend. 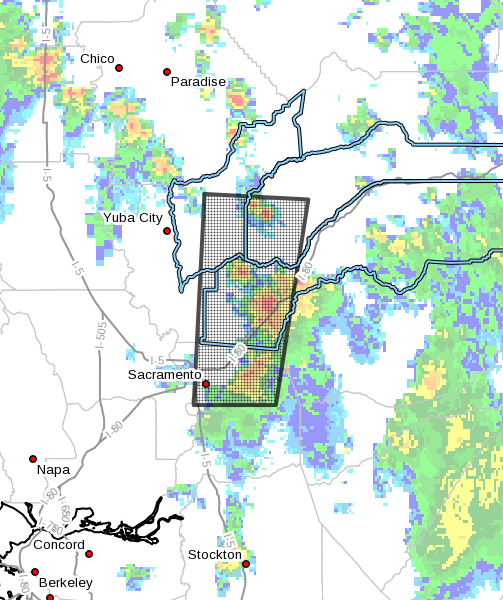 The strongest winds will be over the western half of the valley and into the Delta region. The winds combined with lack of rainfall, mainly over Solano County and surrounding areas, will create the highest hazardous fire weather concerns within the Red Flag Warning area. A weather system from the Pacific Northwest may move through the region during the Wednesday/Thursday time frame which may or may not produce precipitation over parts of the region. (Location of the trough remains highly uncertain at this time.) Behind the system dry northerly flow will return for the Thursday/Friday time period. Temperatures this next week will remain near seasonal normal’s for the valley and slightly below seasonal normal’s for the mountains. October 5, 2018 at 8:51 AM Windy Weekend Warning. A windy weekend is in store in the wake of a weak weather system expected to pass through the Pacific Northwest this afternoon and tonight. Both Saturday and Sunday will have breezy north winds with Sunday seeing the strongest winds. The winds will likely be strong enough in many areas to blow loose objects and debris around as well as to increase fire danger or cause fires to spread more quickly. October 4, 2018 at 6:09 PM Caltrans update: In Nevada County, HWY 49 has both directions at Ladybird Drive blocked due to a traffic incident. There is no estimated time of clearing. A detour is not provided. October 4, 2018 at 5:41 PM Incident on Hwy 49 between Ladybird Lane and Cherry Creek Acres. Numerous law enforcement and emergency services on scene. Use an alternate route if possible. October 4, 2018 at 8:16 AM Showers end today, very breezy north winds this weekend. High pressure building in over the eastern Pacific will bring generally fair skies over the weekend. Breezy to strong north winds can be expected through much of the weekend. October 3, 2018 at 7:18 PM Firefighters have shut off the gas to the meter, PG&E crews don’t need to respond – this is a propane line, not natural gas. October 3, 2018 at 7:14 PM IC reports a free-flowing gasmeter on fire next to the mobile home on North Country, requesting an expedited response from PG&E. All clear on the structure, meaning all occupants are out. October 3, 2018 at 7:07 PM Firefighters expect to have a knockdown on the mobile home fire soon. October 3, 2018 at 7:04 PM First unit has arrived at scene, reports smoke showing and best access is off Hwy 49. October 3, 2018 at 7:01 PM Residential structure fire, mobile home on fire reported with a natural gas leak on North Country Road in the Ponderosa Mobile Home Park in Grass Valley. Numerous engines en route. October 3, 2018 at 6:52 PM Truck on its side, blocking the intersection on Hwy 49 at La Barr Meadows Road. October 3, 2018 at 6:40 PM Power outages: 572 customers in Browns Valley along Spring Valley Road and Marysville Road. PG&E is assessing the cause at the outage location. 166 customers along Temby Road from School Street to Pleasant Street in Grass Valley. PG&E crews are on scene. 15 customers on South Ponderosa Way between Ted Court and Hidden Valley Way. PG&E has assigned a crew to assess the outage. 9 customers on Kearney Court and Wild Turkey Lane in Penn Valley. Power lines down on Kearney Court. October 3, 2018 at 6:36 PM Another tree down on Lake Vera/Purdon Road, just past New Rome. Most of the roadway is blocked. October 3, 2018 at 6:20 PM Electrical hazard on Kearney Court off Wild Turkey Lane in Penn Valley. Power lines are down across a driveway, Penn Valley Fire en route. October 3, 2018 at 6:03 PM Thanks to reader Coulter Adams for his report of 1.5” of rain in 30 minutes with lots of wind near Clear Creek School / McCourtney Rd. October 3, 2018 at 5:47 PM Tree across the roadway on the 17000 block of Purdon Road, one lane remains passable. October 3, 2018 at 5:44 PM Thanks to reader Harmony Williams for this report: A lightning strike hit a car port in the Gold Country Village around 5:15 pm. The strike was described as a fireball. Everyone is safe. October 3, 2018 at 5:30 PM Power lines down on Twin Star Road across Hidden Valley Road in Grass Valley. October 3, 2018 at 5:28 PM Hwy 49 is flooded between McKnight and Idaho-Maryland. Use an alternate route if possible. October 3, 2018 at 5:19 PM Lightning downstrike in the South Yuba Canyon, heavy wind gusts but no rain. Seek shelter and make sure your pets are inside. October 3, 2018 at 4:43 PM Smoke check based on a lookout report on Laporte Road and Ponderosa Way in Yuba County. Units en route. 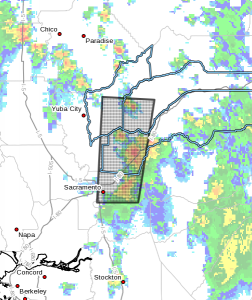 October 3, 2018 at 4:28 PM At 4:21 PM, radar indicated strong thunderstorms were located along a line extending from near Loomis to Rancho Cordova. Movement was north at 15 mph. Winds in excess of 30 mph and pea size hail are possible with these storms. Locations impacted include:Sacramento, Roseville, Citrus Heights, Folsom, Rocklin, Auburn, Grass Valley, Carmichael, Fair Oaks, El Dorado Hills, Rancho Cordova, West Sacramento, Lincoln, Lake Of The Pines, Lake Wildwood, Loomis, Gold River, Foothill Farms, Rio Linda and Pleasant Grove. Frequent cloud to ground lightning is occurring with this storm. Lightning can strike 10 miles away from a thunderstorm. Seek a safe shelter inside a building or vehicle. October 3, 2018 at 3:05 PM Accident on Hwy 49 near Moonshine Road, no injuries but the roadway is partially blocked. Emergency services are on scene, traffic control is being set up. October 3, 2018 at 2:28 PM Structure fire on Wolfgang Road in Truckee, after a direct lightning hit. Fire crews are on scene, the road is closed at this time. October 3, 2018 at 1:40 PM Now an augmented dispatch for the reported vegetation fire on Laporte Road in the Challenge-Brownsville area. October 3, 2018 at 1:35 PM Reported vegetation fire on Laporte Road 1/4 mile east of Stagecoach Trail, possibly 3 separate spots. Units en route. October 3, 2018 at 1:27 PM Vehicle accident on Oak Tree Road, reported as a vehicle off the roadway. Units en route. October 3, 2018 at 1:09 PM Firefighters in the area report waterdogs but no smoke in the area. All engines are returning to their quarters. October 3, 2018 at 1:00 PM Smoke check in the Dobbins area, Frenchtown and Indiana School Road. Units are en route after a report by the lookout of intermittent smoke. October 3, 2018 at 12:59 PM Thunderstorms are starting to develop in the high country. Lightning activity is starting to pick up. October 3, 2018 at 12:24 PM Emergency services are on scene at Little Valley Road, reporting a transformer has exploded. 1,656 homes have lost power. PG&E crews are en route. 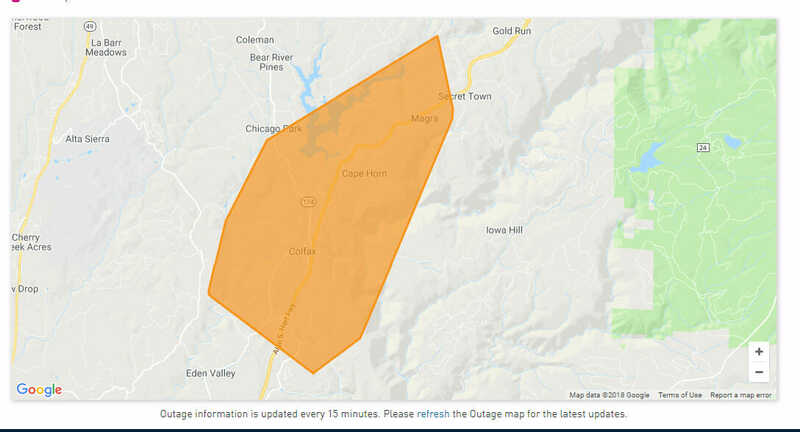 The outage extends from Alta Sierra to McCourtney Road. October 3, 2018 at 12:15 PM Report of power lines sparking on Hwy 49 at Little Valley Road. October 3, 2018 at 11:13 AM Reported fire is a tractor kicking up a lot of dust in the Brewer Road area. No fire. October 3, 2018 at 10:25 AM CHP report of a possible brush fire on Hwy 49 and Brewer Road. Units are en route. October 3, 2018 at 9:08 AM Nationwide Emergency Alert Test today at 11:18 am. Your cell phone will emit a rather strident tone and vibrate at 11:18 am today, part of a nationwide emergency alert test conducted by FEMA. Your local county alert system is not connected to this test. Nevada County are notified of local emergencies via Code Red, Placer, Sacramento and Yolo counties use PlacerAlert, Yuba County sends Code Red notifications. Sign up for these systems to get alerts specific to your area. These local systems allow you to enter specific locations, be that your home, your workplace or your family/loved ones address. October 3, 2018 at 7:50 AM Unsettled weather continues, chance of thunderstorms this afternoon. An early season low pressure system off the SoCal coast will shift through the south state over the next couple of days. This will bring unsettled weather over much of the state with isolated thunderstorms today. The low will also bring in a cooler airmass for below normal daytime temperatures the next couple of days. October 2, 2018 at 5:25 PM A whiff of smoke in the air? Several large agricultural burns in Yuba and Sutter counties are sending the smell of smoke into Yuba, Placer, Nevada and Sacramento counties. At this time, there are no vegetation fires in the area. October 2, 2018 at 11:48 AM Accident on Hwy 49 at Ladybird Drive. Emergency units are on scene. 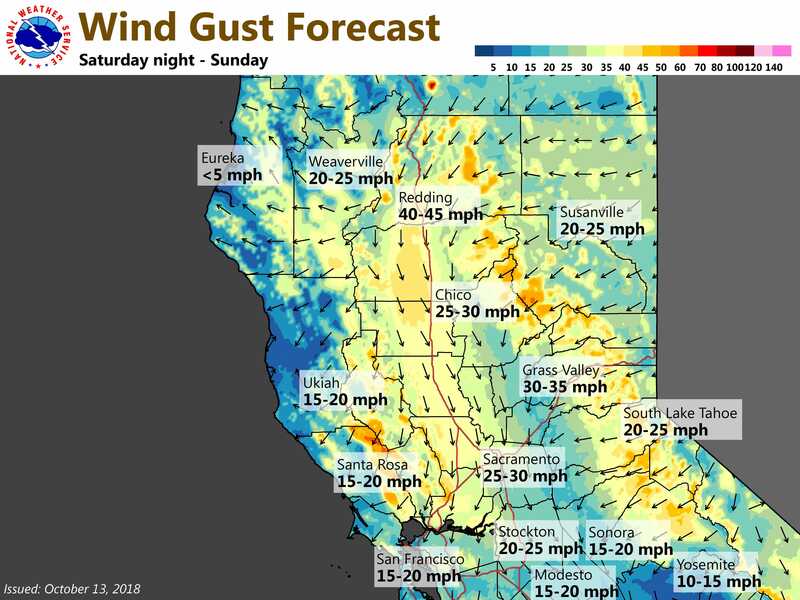 October 2, 2018 at 9:40 AM A disquieting update from the NWS Sacramento: Confidence is increasing for a round of gusty winds late Saturday into Sunday. Wind gusts exceeding 40 mph will be possible. This will also raise fire weather concerns. We will try to provide more details as this event gets closer. October 2, 2018 at 7:13 AM Unsettled weather with very light precip through Thursday. We will see light showers today with the chance for scattered t-storms tomorrow. October 1, 2018 at 8:21 PM Incident Commander reports a 20 by 30 spot along the hillside on the south side of the bridge. Two more engines to continue in, all other resources can cancel. October 1, 2018 at 8:18 PM Firefighters are in the area, they have located a fire. October 1, 2018 at 7:50 PM Possible vegetation fire on the Colfax side of the canyon near Yankee Jims bridge. Numerous engines en route. Limited details from a 911 disconnected call, no exact location. October 1, 2018 at 9:56 AM First rain! Roadways will be slick with the summer buildup of oils and dust. Be extra careful out there. October 1, 2018 at 7:44 AM Five cows are out for a morning stroll on Mooney Flat Road and Pleasant Valley Road. October 1, 2018 at 7:13 AM Unsettled weather this week with chance of rain and cooler than normal temperatures. Low pressure system will drop south over Northern California bringing rain showers to the area. Rain will begin Monday in the Coastal and Northern Mountains. It will then spread into the Northern Sacramento Valley and further south. Clouds and lingering shower will move out of the area on Wednesday. October 1, 2018 at 6:56 AM Use caution on southbound Hwy 49 at Gauthier Road. Debris in the lanes is causing drivers to slow down and swerve. 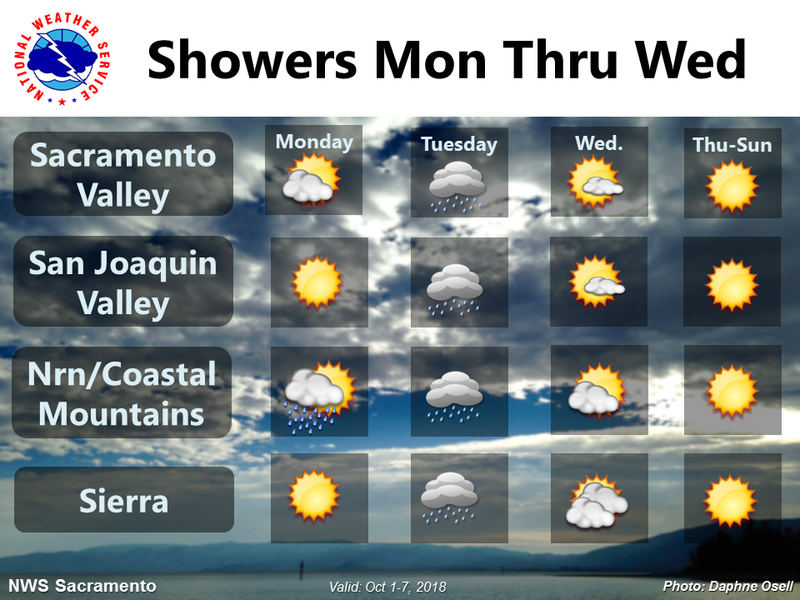 October 1, 2018 at 00:01 AM Low pressure system will drop south over Northern California bringing rain showers to the area. Rain will begin Monday in the Coastal and Northern Mountains. It will then spread into the Northern Sacramento Valley and further south. Clouds and lingering shower will move out of the area on Wednesday. The weekend will see dry conditions and sunny skies, with Valley temperatures returning to the mid 80s. October 1, 2018 at 00:00 AM If you are looking for last month’s log, you can find it here.